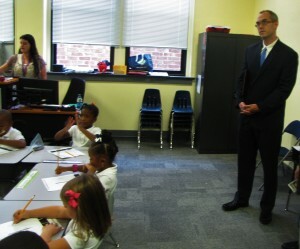 Wilmington- Friday, NC Office of Charter Schools Director, Joel Medley, visited Douglass Academy in downtown Wilmington. The visit accompanied a letter officially removing the public charter school from the Governance Cautionary Status under which it was placed last year for opening with fewer than the state mandated 65 students. Douglass Academy opened for its second year in August, nearly tripling its first year’s enrollment. The public, tuition-free charter school currently serves 86 students in grades K-3, which places them well above the state minimum. Medley toured the campus, located in the historic Peabody Building, and noted the school’s extensive renovations and upgrades. “The work that has been done to renovate the facility shows what can be done with the flexibility afforded to charter schools in the law,” he remarked. Director Medley observed lessons in each classroom and spoke with Charter Day School, Inc. Board Chairman, John Ferrante about Douglass Academy’s classical curriculum and Direct Instruction teaching methods. Ferrante explained that this educational model was the same used at Charter Day School, in Leland, which outscored both Brunswick and New Hanover Counties on End-of–Grade tests, and Columbus Charter School, in Whiteville, which was the highest scoring school in Columbus County on End-of-Grade tests. “I am quite pleased with the education I see being delivered to the students at Douglass Academy,” Medley offered.